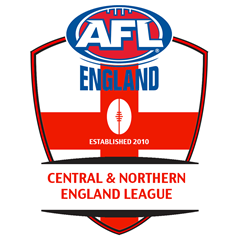 The Australian Football League Central & Northern England has reached half-way through the 2017 season. The following story is from the AFLCNE website and looks at the journey so far this season with hints towards what the season may yet bring. With the last update being a month ago (blame it on the weather/footy/beers) we at the league thought it was an opportunity to give you all an update on the past few weeks (and a lot has happened). 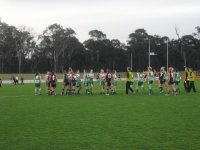 The final round of May saw the Rams consolidate their position just inside the playoffs by defeating a travelling Tigers side, while the Mozzies narrowly overcame one of this season’s finals contenders the Wolverines in a show of intent to put themselves comfortably in prime position. Meanwhile, the Thunder secured their first points by default, after mechanical issues meant half the travelling Merseyside team were stuck near Manchester (credit goes to those who made it playing in an excellent scratch match with Sheffield and Nottingham players). Next up came this season’s first lightening round, in Newcastle. And for the first time in nearly two years, the Mozzies tasted defeat, against a Scorps side hungry for a spot in the big dance, and a strong Tigers side brimming with confidence. Meanwhile, the Saints were on the receiving end of two defeats. This saw the Mozzies knocked off top spot and the Scorps looking forward to what was shaping up to be a decisive clash the following week. After a major wobble in the lightening round, the Mozzies ran out against the Scorpions the following week in what was looking like a season-defining clash. While the Scorps put in a valiant performance, the Mozzies took a win to put them back at the top of the table on percentage. Meanwhile, Wolves were keen to show they were well within the title race, and came up against a Tyne Tees Tigers side with the wind in their sails. In a tasty clash, it was the Wolves who came out on top to keep themselves in the leading pack. Elsewhere, the Rams took the points from the Saints to put themselves 4 points clear of fifth with a game in hand. And after all that drama, there’s not too much change in the ladder. The Saints are still looking for their first points and will hope the upcoming lightening round in Merseyside (1st July) will deliver. Manchester’s position seems more precarious at the top, with the Scorps and Wolves sensing that they could be the ones to take the minor premiership. The Thunder will be hoping to leapfrog the Tigers and equal last season’s position, although the Tigers will surely have belief now that they can make the finals for the first time in their history, but the Rams will be holding on tightly to that final spot. It’s all still to play for, with the next action being the Merseyside lightening round on 1st July.